Sign Up Now! Open a Bookmaker.com Betting Account! In the online sports betting industry there are leaders and there are followers. With over 14 years as the first sportsbook to post odds, Bookmaker.com is one of, if not the overall, leader and should warrant a trip for any person looking for a one-stop shop when it comes to online gaming. If you can think of it, Bookmaker.com probably has odds on it. They boast one of the biggest lineups of bets offered in their sportsbook that you’ll find. Short on time? Bookmaker features mobile betting for any cell phone or mobile device (Android, Blackberry, iPhone, etc.) on not just their sportsbook, but also their full service Racebook, online casino and poker room. You’ll also earn Rewards points that you can redeem for free gear or even airline travel! All major sports are represented well at BookMaker.com. As the first sportsbook to publish lines for American sporting event, if you want to make a sports bet, rest assured that not only will BookMaker.com have the game you want to bet on, but they’ll also be the first to publish those lines. In addition to the major American sports they also feature action on every major Soccer league, Boxing cards, Motor Racing and more. BookMaker.com offers its members a bonus on every deposit, not just the first. Their initial deposit bonus will net you a cool 15%, as long as you put in at least $100. After that, you will get 10% on each subsequent deposit, but if you’re savvy enough to deposit on a Tuesday that doubles to a 20% bonus on every deposit of at least $100! Certain restrictions do apply, so check out their bonuses page for more information. When you call yourself the place “where the line originates”, you know you’re going to get some good betting lines. 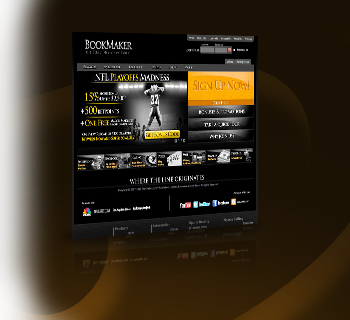 While most online sportsbooks take their lines from certain services, BooKMaker.com creates their own – and before anyone else. By taking a lead position BookMaker is opening itself up to mistakes and giving bettors the advantage, but with over 14 years in business they must be doing something right. Several years ago, BookMaker.com was not renowned for its customer service, but that seems to be a distant memory as we found their customer service to be excellent and on point. BooKMaker offers many different contact numbers and other contact points which is a must given the sheer number of products they offer. When you have a Mobile Betting question? Call the Mobile Betting number. When you have a Casino question, call the Casino number. This focused approach earns high marks from us, but their email response time stops them from earning a perfect score. Given the difficulties all online gaming websites face these days, BookMaker.com nonetheless offers a good number of Payout options. We just hope you’re not in a rush though, as payouts often take between 7 – 10 business days, no matter the method. There are also fees on payouts, some of the highest we’ve seen compared to the competition. If you want your payouts quickly and don’t want to pay, this might not be the best choice in books for you. With so much else to offer it’s little wonder BookMaker doesn’t publicize its live betting, but we were surprised by the product itself. BooKMaker offers live betting on most major American sports and events, but the lineup does vary week-to-week. It is nice to see so many lines offered live and the interface does seem user-friendly, if not a little ugly and in need of a severe update. Get a 15% Bonus on your 1st deposit at Bookmaker! Open a Bookmaker betting account now!